As of Friday morning, negotiations had come to a standstill on saving a nearly century-old building in Lincolnville. The city of St. Augustine and St. Paul AME Church officials met recently to discuss the city’s proposal for preserving Echo House, which St. Paul AME rejected, said the Rev. Ron Rawls, pastor of the church. Commissioners are expected to discuss their options at tonight’s City Commission meeting, City Manager John Regan said. Those options include allowing the demolition to take place or refusing to issue a demolition permit, Regan said. In the meantime, Regan said he planned to be in touch with St. Paul AME officials to try and work something out before Monday night. “We’re going to have a discussion about what happens [as of] April 16,” Regan said. St. Paul AME plans to demolish the property, which is on Dr. Martin Luther King Jr. Avenue in St. Augustine near the church, on April 16 or later if nothing is resolved. That’s when a 10-month waiting period will expire that was set by the city’s Historic Architectural Review Board, which reviews demolition requests for older structures and which approved a certificate of demolition for Echo House. 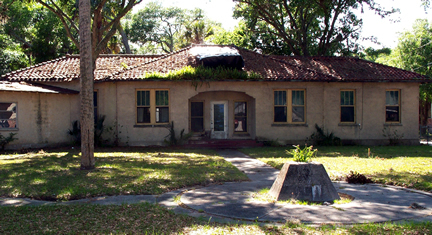 The waiting period was intended to give the community time to find a way to save Echo House. A demolition permit is still needed from the city’s Planning and Building Department. Opened in the 1920s as a community center, the property belongs to the church. The city has a reverter clause on the property that says it has to be used for charitable, philanthropic and nonprofit purposes, or ownership goes back to the city. The latest attempt to save the building from demolition was led by members of the nonprofit Lincolnville Historical Preservation and Restoration Society, including co-chair Madeline Wise. Wise said she wants the city to have a judge determine whether St. Paul’s plans to use the property in part for parking count as a nonprofit, charitable and philanthropic purpose. “They don’t want to save the place,” Wise said of St. Paul AME. The property changed hands and deteriorated over the years. After St. Paul AME Church took over the property in 2010, the church planned to rehabilitate the building, but that hasn’t happened. And in recent years, Rawls has applied to demolish the property in part to make room for parking. The city’s recent offer to St. Paul AME Church included: Dividing the property into two parcels. The building and part of the land would go to the city. The rest would go to the church, and the city would remove its reverter clause from the church’s part of the land. The city would also provide $90,000 to help the church upgrade its property for parking and open space for children to play during summer camps, or other uses. The city would also have committed, if the commission had approved the agreement, to restoring the building and looking for grants. The budget was expected to be $350,000. The city would also have sought to use it for low-intensity uses, such as a nonprofit office or museum, that wouldn’t compete with the church’s needs for parking. But church leaders rejected the deal, Rawls said. (7) A demand for relief that the property be condemned and taken for the uses and purposes set forth in the petition, and that the interest sought be vested in the petitioner. History.—s. 1, ch. 65-369; s. 2, ch. 77-51; s. 358, ch. 95-147; s. 3, ch. 2006-11. "Since good faith negotiations have apparently failed,"
Who said so and what is the rush? How about a top priority list of citizen grievances? We still have homeless, rats, cats, dogs, and Pig Tourism customers breaking beer bottles, puking, littering and crapping on the streets. I would rather see the city gangsters do something about banning those atrocious leaf blowers (germ, projectile and disease spreaders) that generate 185 mph winds.